Normally when we do a post about a ball, puck, or occasional hot dog hitting a fan in the head, it’s bad news for the fan. But not today. 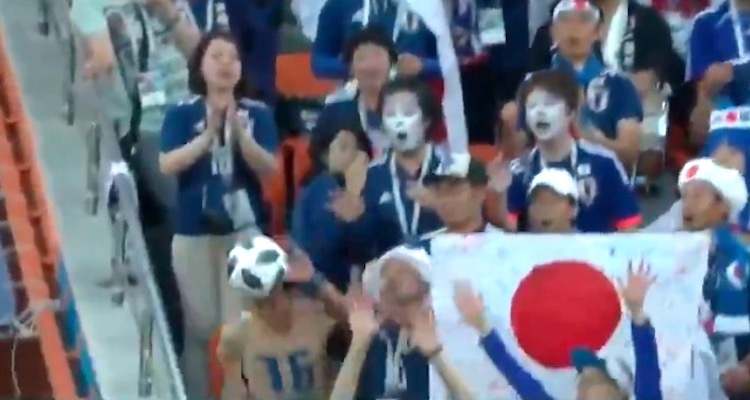 A Japanese fan took a ball to the head during Sunday’s Group H matchup between Senegal and Japan at the 2018 FIFA World Cup. However, it wasn’t because the fan wasn’t paying attention. It was quite the opposite. With the score tied 1-1 in the 52nd minute, a Senegalese player fired a rocket over the Japanese goal, right into a section of Japanese fans. While most fans flinched or brought their arms up to cover their heads, one guy—the only person in the whole section not wearing a shirt—refused to flinch. And when the ball came right to him, the shirtless fan headed the ball away like a pro. Prior to the game against Senegal, Japan coach Akira Nishino joked that he told his players to grow a few centimeters to improve their aerial game. Clearly what they really need to do is find out who this shirtless dude is and add him to the roster before Japan’s final game against Poland on Thursday.